Looking for hotels near Santa Monica Beach? You will be thrilled with the wide range of hotels that can accommodate couples, families and trendy adults with or without children which boast easy access to the beach as well as the Santa Monica Pier. For travelers looking for a historic luxury hotel with resort style amenities then the Fairmont Miramar Hotel and Bungalows is ideal. 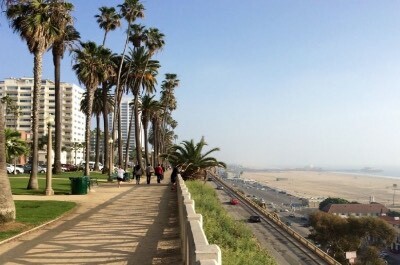 Trendy adults can enjoy historic boutique style properties like the Georgian Hotel, the Hotel Shangri-La Santa Monica or the Ocean View Hotel. Families that are looking for an upper-mid-range hotel should try the JW Marriott Santa Monica Le Merigot or the Loews Santa Monica Beach Hotel and the Oceana Beach Club Hotel is superb for couples. Value and casual travelers will be pleased with the laidback atmosphere at The Hotel California® and the Bayside Hotel which boast comfortable accommodations. If you are seeking an upscale boutique hotel near Santa Monica Beach that offers quick access to the beach and many attractions then the Shore Hotel is ideal for you. Located directly across the street from the Santa Monica Pier, the Shore Hotel is an easy 2-minute walk to Santa Monica Beach and the Third Street Promenade. The Shore Hotel has a sleek and stylish modern four floor architectural design with 164 rooms and suites that feature a chic contemporary interior. Rooms range in size from 304 to 375 square feet with a choice of bedding and a private balcony that boasts views of the city, gardens, pool, partial-ocean or full ocean. Junior suites have 375 square feet with an integrated sleeping/living area and a sofa sleeper as well as a private balcony with city or partial-ocean views. One-bedroom king suites are 465 square feet with a separate living room that contains a sofa sleeper and 2-balconies that sport partial or full ocean views. The Shore Hotel has a 2-minute walk to the heart of Santa Monica Beach where you will find plenty of sand to lounge, beach volleyball courts, nice swimming and a plethora of watersport activities from surfing to boogie boarding to parasailing. The Shore hotel near Santa Monica Beach has a great location for exploring with numerous attractions within walking distance like Palisades Park, Tongva Park and shopping at Santa Monica Place as well as all the numerous activities at the Santa Monica Pier. The hotel has a nice freshwater swimming pool with sundeck, a fitness center and in-room spa treatments are available. Dining includes several wonderful offsite eateries within walking distance which include the Misfit Restaurant and Bar, the Red O Restaurant serves Mexican dishes and Bruno's for Italian cuisine. Nightlife is plentiful on the Santa Monica Pier with street performers, arcade style games and you can views the skyline from the ferris wheel. When you are searching for a luxury historic hotel near Santa Monica Beach that is packed with resort style amenities for families and couples then you should stay at the Fairmont Miramar Hotel and Bungalows. Located 5-blocks north of the Santa Monica Pier along Ocean Avenue, the Fairmont Miramar Hotel and Bungalows is situated on 5-acres overlooking Palisades Park/Pacific Ocean and the hotel offers complimentary transportation to Santa Monica Beach. The Fairmont Miramar hotel near Santa Monica Beach has three building components; a six story and a ten story wing as well as 32 bungalows which were constructed during the 1930s. The hotel contains 302 rooms and 32 bungalows which sport a luxurious contemporary decor. Rooms in the Ocean Tower are 275 square feet with a choice of bedding, floor to ceiling windows and a private balcony that boasts city, garden or ocean views. The Palisade rooms have 400 square feet with a choice of bedding with a city or garden view (no balconies). One-bedroom suites in the Palisade building range from 500 to 785 square feet with a separate living room that contains a sofa sleeper and offer views of the city, garden or ocean (no balconies). One-bedroom Tower suites have 550 square feet with a separate living room, floor to ceiling windows and 2-balconies with ocean views. Bungalows are located within the lush garden landscape and range from a Signature with 350 to 425 square feet to bi-levels with 1,000 square feet to the two-bedroom Bungalow One with 2,500 square feet. The Fairmont Miramar Hotel and Bungalows offers complimentary transportation to the Miramar Beach Club located on Santa Monica Beach where you will find complimentary use of beach/watersport equipment as well as beachside service. The Miramar Beach Club also features several organized events for children as well as teens directly on the beach. The Fairmont Miramar Hotel and Bungalows are centrally located to many attractions that are within walking distance such as Tongva Park, the Third Street Promenade and the Santa Monica History Museum. The Fairmont Miramar hotel near Santa Monica Beach contains a freshwater swimming pool with sundeck, a fitness center and a full service spa. Dining at the hotel includes all three meals at the Lobby Lounge as well as the Fig Restaurant and the Bungalow serves light bites from noon until midnight. Nightlife within walking distance includes the Ye Olde Kings Head or the Santa Monica Playhouse for live theater. 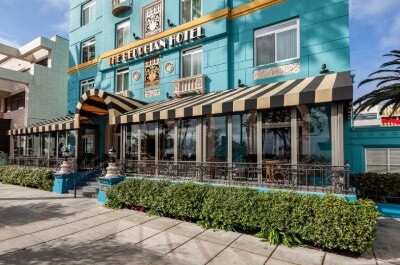 The Georgian Hotel is a great historic hotel near Santa Monica Beach which is ideal for all types of travelers especially couples. Located 2-bloks north of the Santa Monica Pier along Ocean Avenue, the Georgian Hotel is situated adjacent to the southern section of Palisades Park and is a short 5-minute walk to Santa Monica Beach. The Georgian Hotel was constructed in 1933 and features an Art Deco/Romanesque Revival eight floor architectural style with 84 rooms as well as suites which boast a similar Art Deco interior. Rooms range in size from 226 to 278 square feet with a choice of bedding and various views of the city as well as ocean view rooms which feature floor to ceiling windows. One-bedroom Signature and Ocean view suits are 548 square feet with a separate living that contains a sofa sleeper and views of the city or ocean from large picture windows. The Georgian Hotel has an ideal spot for exploring with only a 5-minute walk to Santa Monica Beach where you will find lots of room on the sand to lounge, beach volleyball courts and nice swimming. There are numerous vendors renting your favorite watersport equipment and water adventures on the beach. The Georgian hotel near Santa Monica Beach allows for easy walking access to many attractions which include the Third Street Promenade, the Santa Monica Pier where you will find Pacific Park as well as the Santa Monica Aquarium and the Annenberg Community Beach House is a 20-minute walk. The hotel offers a fitness center but there is not a freshwater swimming pool onsite. Dining onsite includes all three meals at the Veranda Restaurant and you will find plenty of other dining options within walking distance that include the Water Grill Santa Monica, Boa Steakhouse and SUGARFISH by sushi nozawa. Nightlife is a short walk away with cold libations at the Craftsman Bar and Kitchen or Bar Chloe and Mi's Westside Comedy Theater is perfect for laughs. The JW Marriott Santa Monica Le Merigot is an upper-mid-range hotel near Santa Monica Beach which is ideal for families that are searching for easy access to the beach and surrounding attractions. 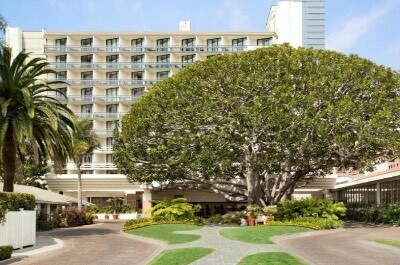 Located 2-blocks south of the Santa Monica Pier, the JW Marriott Santa Monica Le Merigot is situated within a 3-minute walk to Santa Monica Beach as well as 5-minute walk to shopping at Santa Monica Place. The JW Marriott Santa Monica Le Merigot has a modern five story architectural design with 175 rooms and suites that boast a modern interior. Guest rooms range in size from 330 to 370 square feet with a choice of bedding and views of the city or ocean from floor to ceiling windows (some rooms have balconies available). Premier guest rooms have between 430 to 470 square feet with a sitting area and terrace that overlooks the Pacific Ocean. The JW Marriott Santa Monica Le Merigot features easy access through the courtyard and parking lot to Santa Monica Beach where you will find plenty of watersport activities from surfing to boogie boarding to swimming and there is ample beach area for lounging as well as beach volleyball. The JW Marriott Santa Monica Le Merigot has a perfect spot for exploring the area with many attractions within a 5 to 10-minute walk such as the Santa Monica Aquarium, Tongva Park, Third Street Promenade and Venice Beach. 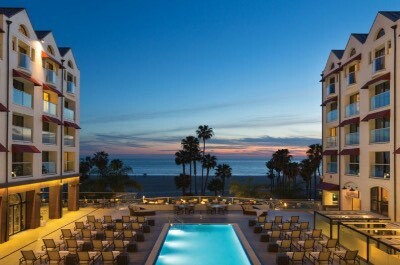 The JW Marriott hotel near Santa Monica Beach has a freshwater swimming pool, fitness center and full service onsite. Dining onsite includes the Cezanne for breakfast as well as the Le Troquet Patio Lounge for lunch and dinner. Offsite dining choices within walking distance include the Herrringbone for seafood, the Coast Beach Cafe and Bar, Cha Cha Chicken serves Caribbean delights as well as Bruno's prepares Italian. Nightlife is abundant within a short walk to the Third Street Promenade and the Santa Monica Pier where you will find street performers as well as a variety of entertainment venues for the whole family. When you are looking for a luxury family-friendly hotel near Santa Monica Beach that boasts easy access to many stellar attractions and the beach then the Loews Santa Monica Beach Hotel is perfect. 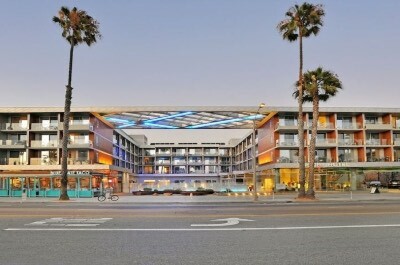 Located 2-blocks south of the Santa Monica Pier, the Loews Santa Monica Beach Hotel is situated directly across the street from Santa Monica Beach and is within a 5-minute walk to the Third Street Promenade. The Loews Santa Monica Beach Hotel has a modern eight floor architectural style with 347 rooms and suites that feature a contemporary decor. All rooms and suites boast a private balcony with views of the city, coastline, pool area or Pacific Ocean. Standard rooms range in size from 330 to 375 square feet with a choice of bedding and are available with a variety views (Coastline view rooms have a sofa sleeper). Pool Side Cabana rooms are 330 square with a choice of bedding and has direct access to the pool from a 250 square feet patio area. Fire Pit rooms have 375 square feet with a choice of bedding, a sofa sleeper and a 250 square feet patio/terrace with direct pool access or beachfront views. The Loews hotel near Santa Monica Beach is a short 2-minute walk to the beach where there are beach volleyball courts, watersport equipment rentals, watersport activities, plenty of space to lounge and the swimming is good. The Loews Santa Monica Beach Hotel has a perfect spot to explore the area with many attractions within walking distance such as Palisades Park, the 26-Mile Bike Path, the Santa Monica Farmer's Market and the many activities located on Santa Monica Pier. The Loews hotel near Santa Monica Beach has a great freshwater swimming pool with poolside service on a sundeck that overlooks the Pacific Ocean, fitness center and full service spa. Dining onsite includes Ocean and Vine for all three meals; the BarBelles serves lunch and dinner as well as the Blue Streak serves poolside lunch. Offsite dining choices within walking distance are plentiful with Chez Jay, Cora's Coffee Shop prepares diner cuisine, Big Deans Oceanfront Cafe and Ristorante al Mare serves Italian specialties. Nightlife onsite includes a nice libation at the BarBelle or you can venture within walking distance to the Third Street Promenade which feature numerous entertainment venues as well as live music at nearby Harvelle's Blues Club. 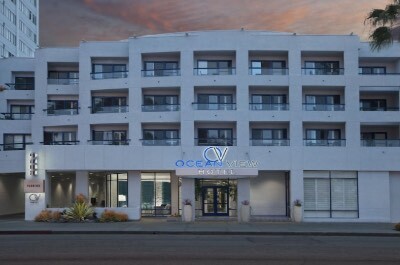 The Ocean View Hotel is an upper-mid-range boutique hotel near Santa Monica Beach which is superb for couples searching a unique atmosphere with easy access to the beach. Located in downtown Santa Monica, the Ocean View Hotel is situated 2-blocks from Santa Monica Beach and the southern portion of Palisades Park. The Ocean View Hotel has an interesting modern four story architectural design with 66 rooms that were refurbished in 2014 and feature an Art Deco interior. Courtyard rooms feature 300 square feet with a choice of bedding and are available with or without a balcony. Ocean view rooms have 300 square feet with a king size bed and sweeping Pacific Ocean views. The Ocean View hotel near Santa Monica Beach is an easy 3-minute walk to the beach where you will find lots of space to lounge on the sand, beach volleyball courts, swimming and lots of watersport activities that range from windsurfing to surfing to standup paddleboarding. The Ocean View Hotel has an ideal spot for exploring with several attractions within a 5-minute walk such as the Santa Monica Pier where you will find Pacific Park as well as the Santa Monica Aquarium or you can go shopping at Santa Monica Place and children will like Tongva Park. The hotel does not feature a freshwater swimming pool or restaurant and you will receive complimentary passes to a nearby 24-Hour Fitness Center. Dining options offsite within walking distance include the Water Grill Santa Monica, Blue Plate Taco and the True Food Kitchen. Nightlife can include a stroll on the 26-Mile Bike Path at sunset or a cold libation at the Craftsman Bar and Kitchen as well as the Commons Ale House. When you are searching for a mid-range hotel near Santa Monica Beach which offers direct beach access and is perfect for families then you should stay at the Hotel California®. Located in the center of Santa Monica, the Hotel California® boasts a 2-minute walk to Santa Monica Beach from a private courtyard entrance and is situated within a 5-minute walk to the Santa Monica Pier. 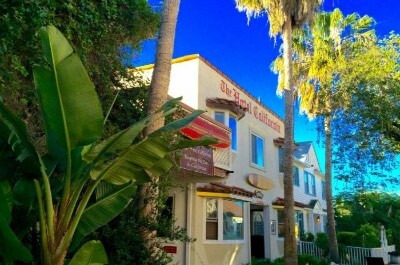 The Hotel California® has a Spanish two floor architectural style with 27 rooms and suites that have been recently updated with a California beach music theme decor. Rooms are spacious with a choice of bedding and courtyard views from a shared balcony. Two-bedroom junior suites boast a sitting room in one room and courtyard views from a shared balcony. The Alcove suite has an open floorplan with bay windows. The two-bedroom suites with kitchenette have a separate sitting area and courtyard views from a shared balcony. The Hotel California® sports direct access through a courtyard tunnel to Santa Monica Beach where you will find lots of area to relax with beach volleyball courts, good swimming and watersport activities that range from surfing to kayaking to parasailing. The Hotel California® is ideally placed next to several attractions such as the Santa Monica Pier as well as Pacific Park which are a 4-minute walk and you are within 2-blocks to Tongva Park. The California® hotel near Santa Monica Beach does not offer a freshwater swimming pool, fitness center or restaurant onsite. Dining options offsite are plentiful within walking distance and include Bruno's for Italian, Casa Martin serves Mexican dishes as well as Ivy at the Shore prepares Creole specialties. Nightlife is a short walk to the Third Street Promenade where you will find plenty of entertainment venues or you can take a 30-minute walk to the Venice Beach Boardwalk. When you are seeking an upscale historic boutique hotel near Santa Monica Beach that is perfect for couples and trendy adults then the Hotel Shangri-La Santa Monica is superb. Located in downtown Santa Monica, the Hotel Shangri-La Santa Monica is situated 2-blocks from Santa Monica Beach and is only minutes away from the Santa Monica Pier. 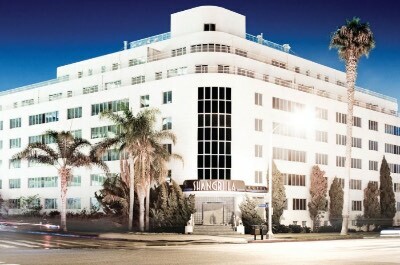 The Hotel Shangri-La Santa Monica was constructed in 1939 with a Streamlined Moderne Art Deco seven story architectural design that features 71 rooms and suites which have an Art Deco interior. Standard rooms range in size from 200 to 300 square feet with a choice of bedding as well as partial-ocean and city views from large picture windows (full ocean view rooms are available). Executive suites have 350 square feet with a separate work room and full ocean views. One-bedroom suites are 600 square feet with varying floorplans that feature a separate living room and sofa sleeper, some are available featuring a gourmet kitchen as well as partial-ocean or full views from bay or picture sized windows. One-bedroom Terrace suites have 700 square feet with varying floorplans that include a separate living room, gourmet kitchen and private terrace that sport partial-ocean or full ocean views. Two-bedroom Luxury suites are 1,200 square feet with a separate living room, gourmet kitchen, 2-bathrooms and panoramic ocean views from picture as well as floor to ceiling windows. The Shangri-La hotel near Santa Monica Beach is a 5-minute walk to Santa Monica Beach where you will find plenty of space to lounge, beach volleyball courts, swimming and a plethora of watersport activities. The Hotel Shangri-La Santa Monica is within walking distance to many attractions including Palisades Park, the Third Street Promenade and the Santa Monica Pier Aquarium. The Hotel Shangri-La Santa Monica has a chic freshwater swimming pool complete with cabanas, a fitness center and full service spa onsite. Dining onsite includes the Dining Room for all three meals and you will find plenty of eateries within walking distance like the Blue Plate Oysterette, Boa Steakhouse as well as SUGARFISH for Asian delights. Nightlife onsite includes the stellar rooftop bar ONYX or you can visit the Mi's Westside Comedy Club or Bar Chloe which are within walking distance. The Oceana Beach Club Hotel is an elegant boutique hotel near Santa Monica Beach which is ideal for couples and younger adults. Located just north of downtown Santa Monica along prestigious Ocean Avenue, the Oceana Beach Club Hotel is situated within a 10-minute walk to Santa Monica Beach and overlooks the Palisades Park as well as Palisades Park. The Oceana Beach Club hotel near Santa Monica Beach has an eclectic 1950s Moderne three floor architectural style with 70 rooms as well as suites that were renovated in 2016 and sport an elegant beach house interior. Deluxe double rooms have 452 square feet with a shared patio and city view. Junior suites are 495 square feet with a king size bed and shared patio that features city or courtyard views. One-bedroom suites range in size from 750 to 850 square feet with a separate living room and sofa sleeper, large picture windows, some are furnished with a kitchen as well as a private balcony/patio with courtyard or ocean views. Ocean view suites are 850 square feet with an open floorplan that features an integrated sleeping/living area which has large windows and views of the Pacific Ocean. The Oceana Beach Club Hotel is a short 10-minute walk to Santa Monica Beach where you will find lots of rooms to relax as well as beach volleyball courts and the swimming is good. You have a wide variety of watersport activities available and the Annenberg Community Beach House is less than 1-mile away. The Oceana Beach Club Hotel is within walking distance to many attractions including the Santa Monica Pier, shopping at Santa Monica Place and Tongva Park. The hotel features complimentary use of bicycles and free yoga as well as surf lessons. The Oceana Beach Club hotel near Santa Monica Beach has a freshwater swimming pool with a sundeck that features a fireplace, fitness center and in-room full service spa treatments are available. Dining onsite includes Tower 8 serves farm fresh cuisine for breakfast and dinner. There is a plethora of offsite dining choices within walking distance that include the Hillstone Restaurant, the Fig prepares Mediterranean and the Misfit Restaurant and Bar serves contemporary cuisine. Nightlife includes sitting by the pool deck fireplace or walking to Ye Olde Kings Head for a libation and you will find numerous entertainment venues along the Third Street Promenade. 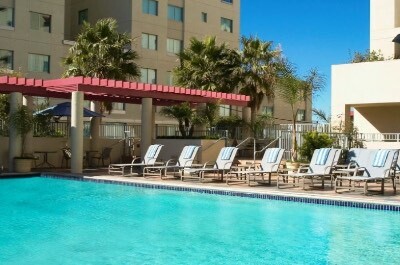 The Bayside Hotel is a perfect mid-range value hotel near Santa Monica Beach for travelers looking to be close to the beach as well as the many stellar attractions in the area. Located just south of Santa Monica in the Ocean Park area, the Bayside Hotel is situated within 2-blocks of Santa Monica Beach and is a 10-minute walk to downtown Santa Monica. 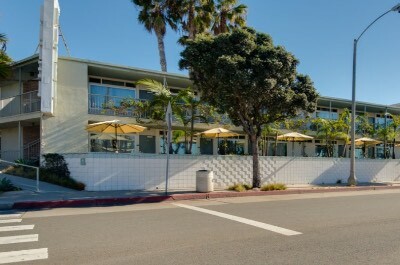 The Bayside hotel near Santa Monica Beach has a 1950s Moderne two story architectural design with a fresh beachy interior. Economy rooms have 210 square feet with a shared patio and varied views. Garden view rooms are sized at 250 square feet with a choice of bedding, a shared patio area and some units are furnished with a kitchenette. Courtyard view rooms have 250 square feet with a queen size bed, small kitchenette (microwave and refrigerator) and a shared patio. Ocean view rooms are 325 square feet with a choice of bedding, a shared patio/balcony and some are furnished with a kitchen. The Bayside Hotel is a perfect spot for you to start your adventures of the area with only a 3-minute walk to Santa Monica Beach where you will find plenty of lounging space, beach volleyball courts and good swimming as well as an assortment of watersport activities from surfing to boogie boarding to standup paddleboarding. The Bayside Hotel is within walking distance to many attractions including 15-minutes to the Santa Monica Pier, Pacific Park, Third Street Promenade and Main Street is 1-block away. The Bayside hotel near Santa Monica Beach has a great manicured courtyard where you can sunbath and relax. The hotel does not offer a freshwater swimming pool, fitness center or a restaurant onsite. Dining choices within walking distance are numerous with M Street Kitchen preparing American style food, Cha Cha Chicken serves Caribbean and Stella Barra Pizzeria. Nightlife is plentiful in the area within walking distance include Mi's Westside Comedy Theater, Harvelle's Blues House for live music and the Chestnut Club for cold libations.